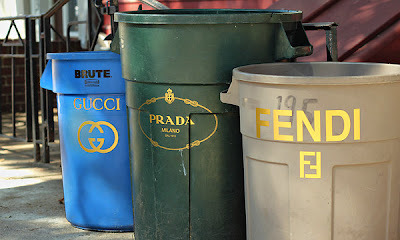 Kat Dy Finds: A Prada Trash Can? Pwede! Chad Silver, an artist, and his wife, Colu Henry, a public relations manager at Bon Appétit magazine, were having trouble with their garbage cans, which kept vanishing from outside their Williamsburg, Brooklyn, apartment. So Mr. Silver, inspired by “Gucci Gucci,” a song by Kreayshawn, a West Coast rapper whose lyrics can’t be printed in this newspaper, decided to brand his cans with gold stickers replicating the logos of the luxury labels Gucci, Fendi and Prada. So far, the labeling strategy seems to be working, Mr. Silver said. The cans, which he branded last month, have stayed put. I won't be surprised if Gucci actually came out with their own line of haute trash cans. Maybe one papered with the double Gs? Wonder how much it'll cost! Incidentally, a logo-obsessed Filipino/Filipina, has taken to wallpapering their CR-V with the Louis Vuitton Logo. I spotted the vehicle while taking a friend on a tour of Intramuros a few days ago and I just had to take a photo. I actually saw the car before in Molito, Alabang, but it drove away before I could take a snap. While we were walking around the walled city, we saw the car drive by again, and I happened to glimpse the inside of the car. Even the interiors were trimmed with LV logos, from the dashboard to the steering wheel. Kaloka! LV much? I'd probably sue the CRV owners, but I'd use the Chad Silver garbage cans for pr—they were featured in the New York Times! Galing!